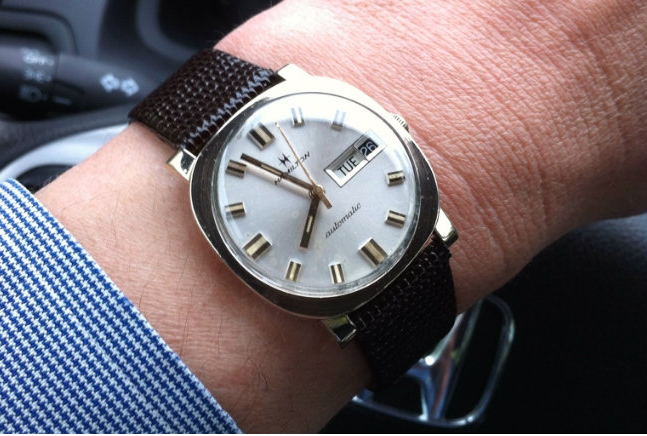 1969 is a natural stopping point for many Hamilton collectors. That's the point Hamilton was purchased by a Swiss company. American production of movements ceased although watches were still assembled in Lancaster for some time to come. 1970's watches often have a look all to their own and they can be a challenge to identify as there aren't a lot of catalogs available. Many watches became a lot bigger, chronographs were introduced, dive watches, etc. were all 1970's themes. However, many design attributes of the 1960's carried forward too. 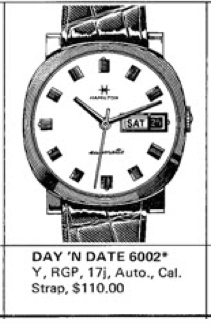 One example is the Day-n-Date 6002. The main reason this watch caught my eye is the cushion shape. That, and it needed a lot of TLC, it was pretty beat up and missing it's crown. It has a Swiss-made automatic movement inside. Watches and clocks are often described by their "complications". Things like the ability to show the day or the date are complications. A stop watch (chronograph) function is a complication. I think that's a great description for these attributes, as anytime I get a vintage watch with a day and date function the first challenge is often figuring out how to set it! It took me quite a while to figure out the day is is set on this watch by pushing the crown in!